Top tune - never get tired of this one. Ragga jungle classic. Would agree wholeheartedly with the funkonaut - spanking jungle on Greensleeves - my favourite line is: "Senor, build me 3 coffins, my mistake, make it 4, I didn't see this bushwacker behind me." 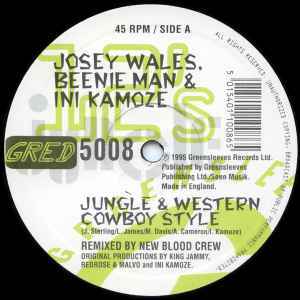 Great Ragga mash up vocals over the nicest ragga jungle beats with dubby bassline. Includes "Dash it in a Cowboy Sty-lee" vocals from Josey Wales, "When we're cming it's stess...might aswell you don't caress yes" from Ini Kamoze, and "The bad man, wicked man.." vox from Beenie man. Cleverly produced classic.